Waking up on Mothers Day this Sunday will be extra special for Rachel from Colchester as she will be celebrating as a mum-of-three for the very first time. 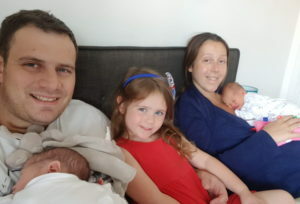 Rachel’s children, Amalie, aged 5, and twins Margot and Teddy, aged six months, were all born after Rachel and her husband Tom had IVF treatment at Bourn Hall Clinic Colchester. “Being a mum is amazing!” says Rachel, as she reflects on her IVF journey to motherhood. What gives Amalie, Margot and Teddy an even closer bond is that although the twins were born four years after their big sister they all derived from the same cycle of IVF treatment as Rachel and Tom had some embryos remaining from their first treatment frozen and stored at Bourn Hall. Embryo freezing is a well-established technique in IVF treatment with excellent success rates. Bourn Hall recommends to its patients that good quality embryos surplus to requirements of a fresh IVF cycle are frozen and stored for future use. Embryos are stored at -197°C and the laboratory technique is highly successful both in post-thaw survival and pregnancy outcome. Rachel became pregnant with the twins after a Frozen Embryo Transfer (FET) at Bourn Hall and they were born in September of last year. “We are so thankful to Bourn Hall for their help in giving us the family we’d always wanted,” says Rachel.